Chappaqua, NY – On Saturday, May 6th, the Westchester-based organization, Up2Us will host an art auction at Chappaqua Station. The event is being called BLOOM, in honor of the phrase “Bloom where you are planted.”Up2Us was inspired to action when Hillary Rodham Clinton first shared this famous saying. In the months following the election, Up2Us has grown to a 3700 member group with members working on political action, community support and progressive issues. The art auction will feature pieces donated by local artists of all ages. The silent auction will have items at all price points with proceeds benefiting the Pleasantville Community Garden and other area charities. Admission is free and the BLOOM Auction is open to the public. The Garden is dedicated to battling hunger in Westchester County where approximately 1 in 5 residents (200,000 people including many children) suffer from hunger and/or food insecurity. The garden was created by Devin Juros in 2011 then an 11 year old student at Pleasantville Middle School. To date, the organization has donated more than 34,000 pounds of fresh produce to 4 local organizations – Hillside Food Outreach, Pleasantville Interfaith Emergency Food Pantry, A-Home and Neighbor’s Link. More than 200 volunteers work with the organization annually including at least 60 kids from ages 5 through 18. Up2Us is thrilled to be working with local artists and the Pleasantville Community Garden to bring this event to Chappaqua. Selected pieces which will be available can be seen at https://www.up2us.us/bloom/ Up2Us always welcomes new members and like-minded organizations to join them. For the most up to date samples and information, see the BLOOM page on Facebook. Chappaqua, NY – On Saturday, March 18th, the Westchester-based organization, Up2Us held it’s kickoff Huddle Meeting. Nearly 150 of the 3,700+ member group arrived ready to hear from lawmakers and their representatives and develop plans of action to resist the Trump agenda. The meeting began with a reading of a heartfelt letter from Chappaqua resident, Hillary Rodham Clinton. The letter was met with applause and tears as people imagined what should have been. Founder Dawn Greenberg introduced the Board of Directors as well as the speakers. Mike Kaplowitz inspired us with this reminder of political physics – “what goes up in politics, comes down and generally if it goes up with extreme velocity, it comes down with similar extreme velocity.” He then introduced State Assemblyman David Buchwald who spoke about NY Health, an attempt to expand access to healthcare for all New Yorkers, the passing of the Reproductive Health Act helping maintain a women’s right to choose and a promise by NY State to make up Planned Parenthood funding if defunded by the Trump administration. He reminded us that with the Republican majority in New York State, many things don’t even get voted on and impressed upon the Up2Us group that the rise and fall Mr. Kaplowitz mentioned only happens if we work hard at the local level. 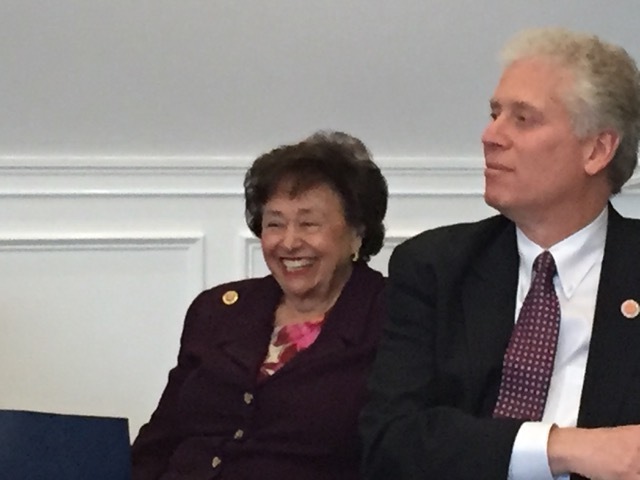 Then, Mr. Buchwald introduced Congresswoman Nita Lowey. 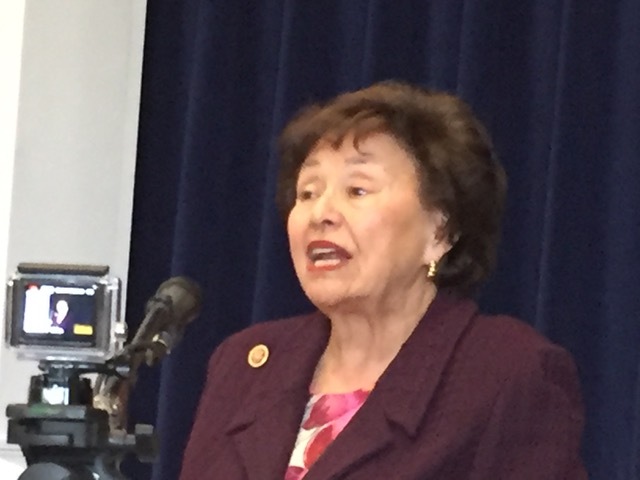 Ms. Lowey spoke for about 15 minutes on topics such from appropriations to gun control; to Donald Trump’s taxes to the Georgia Congressional Race to replace Tom Price. Jon Ossoff represents a real chance to start to turn the House blue. Before leaving for her next engagement, Ms. Lowey had time to take a few questions from the eager crowd. Holly McCall, the Up2Us Executive Director gave an overview of the group’s ideals asked the room to use the information they had just learned and break out into groups to drill down further. She also challenged each person to identify at least three actions they could take once they left the room. Armed with the local and national context, the participants divided themselves into groups focused on one of the following issues: Economic Equality, Local Non-Profit Support, Voting Rights, Political Action, Education, the Environment and Healthcare. Two surprise guests arrived during the breakout sessions to add even more energy and context; George Latimer, State Senator and representing NY Governor Andrew Cuomo, Chuck Lesnick. The meeting ended with refreshments and networking. Up2Us is excited to announce the upcoming event, hosted by the Local Community Support Committee: The Bloom Art Auction. The next Huddle is tentatively scheduled for May 7, with the topic “All Politics Is Local”. The group is extremely active on Facebook. More information on Up2Us and upcoming events can be found at www.up2us.us. Up2Us always welcomes new members and like-minded organizations to join them. Inquiries should be directed to up2us@hotmail.com.